Hello friends. We haven’t spoken in a while, and I want you to know that I have missed you. Lately in my cocktail journey, I have been contemplating the composition of basic drinks. With precious few exceptions, all of the standard drink formulas combine a base spirit with a source of acid and a source of sugar. In spirited drinks, the acid and the sugar often reside in a single bottle, in the form of a fortified wine. In a sour drink, acidity comes from lemon or lime, and sugar comes from syrup, liqueur, or both. I have explored vinegar in the past, and also acid phosphate, but there still exists a lot of unexplored territory. Can the acidic component of drink mirror and meld into the other ingredients, as opposed to merely synergizing with them? There is a wide world of flavors to be captured in syrups and liqueurs, but in most drinks, we find that the carrying capacity for sweeteners is very low before the drink becomes cloying. It may be that we like the interplay between a sweet fruit juices and a liqueur, but that the desirable attributes of such a blend are overpowered by a balancing volume of lemon or lime juice. This problem can be overcome by the use of acid phosphate, but although it is neutral in flavor, it is expensive and its acidity is low relative to its volume. A better choice is to find a source of acid that can reinforce the natural flavors of fruit juice. Most juices contain multiple acids, but a very common one is malic acid, particularly in apples and grapes. It is commonly used in wine-making, but I have been experimenting with it as a souring agent in juice-driven drinks. Malic acid tastes fruity and succulent all on its own, and when it is added to a juice that already contains it, it reinforces and amplifies certain aspects of that juice. Muddle grapes, grate a little fresh cinnamon, and shake all over ice. 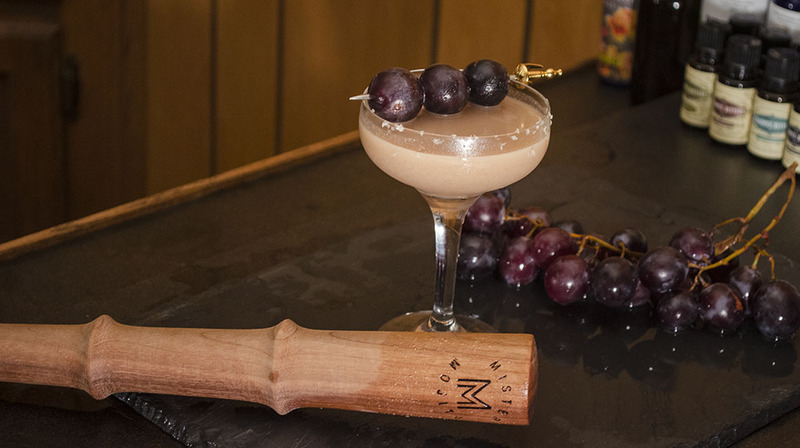 Double-strain into a coupe glass with a lightly salted rim and garnish with skewered grapes. Kyoho grapes are fat and juicy with an intense sweet flavor. They almost taste like grape jelly all on their own. I found some at the farmer’s market and I knew they would be perfect for my malic acid experimentation. Bring peanut butter and water to a boil, then simmer for ten minutes. Stir in sugar and strain through a fine-mesh strainer. The resulting syrup was viscous, unctuous, creamy, and opaque. I made the syrup more intense by adding a bit of salt and freshly-grated cinnamon to the drink before shaking it, but you could also integrate them right into the syrup to simplify the recipe during drink service. I will definitely do so in the future. The cinnamon should not read as cinnamon; it should fade into the background and add just a little woody, spicy complexity to the peanut. I chose to use a wheated bourbon for this because the whiskey is playing the role of bread to the peanut butter and grape. 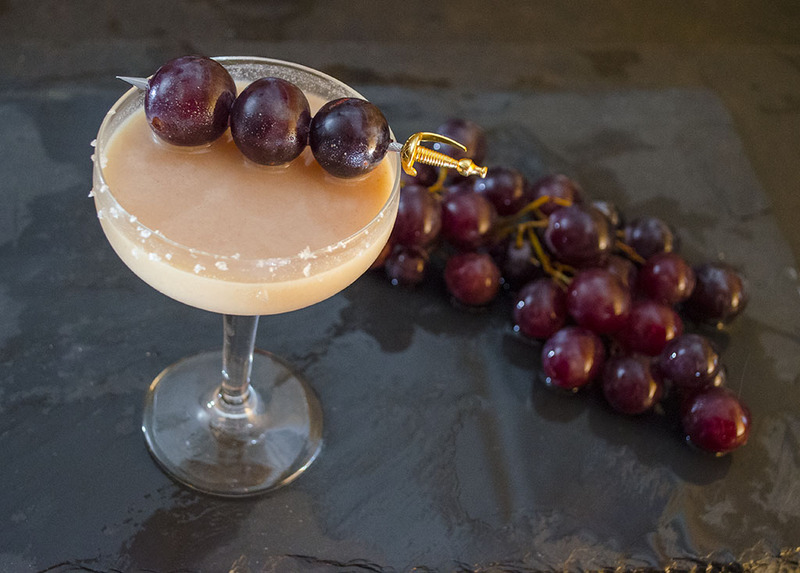 Without additional malic acid, this drink would have been too sweet, but the powdered acid allowed me to make whiskey and peanut butter sour, with grape standing in for lemon. Concept drinks don’t always work out, but this one did. I would proudly serve it to anyone. Categories: modern drinks, original creations, Uncategorized | Tags: alcohol, bartending, booze, bourbon, cinnamon, cocktail, cocktails, craft cocktails, drinking, drinks, fruit juice, grape, grape jelly, jelly, kyoho grape, liquor, malic acid, mixed drinks, mixology, orgeat, pb&j, Peanut Butter, spirits, weller, whiskey | Permalink. Very interesting to see other chemical acids other than Citric Acid and Acid Phosphate on cocktails, and what an easy Peanut syrup!